Do you battle with the removal of persistent stains, water streaks and grime build-ups from your windows? Do they cost you too much energy and you have no will to engage in this household task? This task will no longer consume a lot of your time and efforts! The professionals of window cleaning in Finsbury Park are going to give you a hand! You will be able to use your spare time as you like – the skilled and dependable experts will deal with the wiping and scrubbing. We offer careful cleaning services for all types of glass surfaces. Read further and discover more about the different benefits you can get. We also provide our professional services in nearby areas: Stroud Green, Manor House, Harringay, Stoke Newington, Highbury. 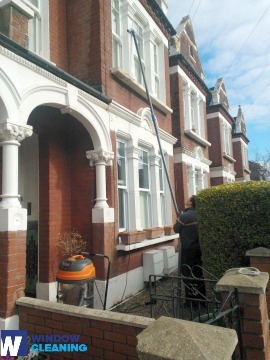 We use progressive methods of window cleaning to guarantee you will enjoy the excellent end results. With the water fed pole system, jet washing and rope access equipment, you can rest assured that your property's windows will be sparkling. Besides that, your property is in good hands – the cleaners are fully insured and carefully trained. Our water fed poles are connected to water supply vans, while our rope access ensures safety – even when we clean skyscraper-sized buildings. You can benefit from these options today – dial 020 3746 3113! You can rely on the abilities and experience of the professionals for cleaning all kinds of windows. The glass surfaces in our proficiency are: small or double windows, bay ones and sash windows. Of course, if you have garden windows, French doors, conservatory or skylights, we will make them spotless, too. With our advanced methods and latest equipment, we can tackle all kinds of window cleaning, even with difficult to reach glass panes. We will make sure that the windows of your business premise will be neat and sparkling, like brand-new. Accomplish that by just ordering our commercial window cleaning. For windows up to the fourth floor, we use water fed extension pole system which is absolutely safe and effective. London is famous for it's tall buildings. So when it comes to those high-rised windows we will bring into action our rope access team. With this advanced way of cleaning, we can give you results like no other! You will see your luminous home after the professional window cleaners in Finsbury Park deal with this task. We deliver great services for the entire London district. The most advanced methods are included in our working routine – including water-fed extension pole system and and jet washing. You will surely see the change domestic hygiene – we use purified water for the process of inside/outside window cleaning. Contact us now on 020 3746 3113. Our customer service agents will guide you and answer any inquiries. Furthermore, you can use our on-site booking from.